The 3rd Busan One Asia Festival boasted a star-studded line up throughout its nine-day run at multiple locations in the southwestern city. 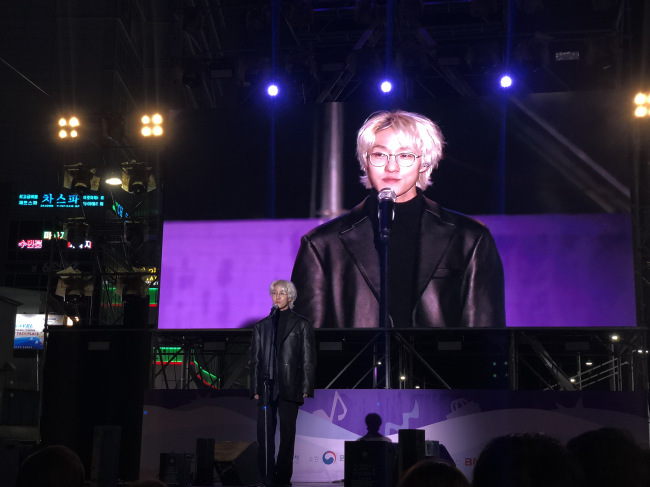 Zion.T was one of the singers that took to the stage on Gunam-ro to perform live in front of Haeundae Beach on Friday. During his performance, the singer-songwriter sang his latest song, “Hello Tutorial” featuring Red Velvet’s Seulgi. “You may notice that Seulgi is not here with me. This means you must help me sing Seulgi’s part,” said Zion.T, interacting with the audience. “Seeing you sing along to my song -- I truly realize now that I am more a songwriter than a singer,” Zion.T said. The Busan One Asia Festival took off on Oct. 20. Busan Asiad Main Stadium, Busan Citizens Park were two other locations where performances were held. EXO, Wanna One, Seventeen, NCT 127, Mamamoo, EXID, GFriend and more performed at the festival’s opening. Red Velvet, NCT Dream, April, KARD, Astro, TeenTop and more were to close out the festival on Sunday night.